The smell of the sweet country air and the aroma of freshly baked scones and roasted coffee beans, all of this and more, just a few minutes from Fourways Shopping Mall, Montecasino Entertainment and Casino Complex and Broadacres Barnyard Theatre. This magnificent lodge with its rolling lawns and shimmering dams is tranquil, serene and perfect for execs to "brain storm", with no interuptions and no other conference delegates to invade your privacy. 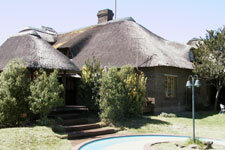 We have a conference room to cater for 18 delegates in "U" configuration or 30 in class-room style and 60 cinema layout.Set on a secure 7 acre country property with waterfalls, dams and magnificent sunset views, Chartwell Country Lodge is the ideal setting to bring focus to problem-solving and life back into perspective. The Pub Lounge offers a comfortable area to relax over an ice cold beer, or on a cold winter's night, warm up in front of a roaring log fire. Wind down and sip sundowners while enjoying one of our many magnificent sunsets, or simply relax in the Jacuzzi. A dip in our sparkling swimming pool is also an excellent way to relax. 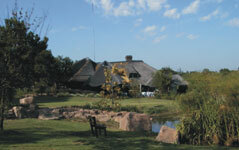 A secret garden is located about 50 metres from the lodge, for those with a taste for peace and tranquillity. Choose the T.V lounge or the privacy of your room to watch the latest sporting event or a good movie on satelite. The Loft Lounge is the perfect place to read a book, from our well-stocked library or just chill-out. Our dams are well stocked with fish and an early morning walk is an enjoyable way to work up an appetite for a delicious breakfast. The kiddies Tree House and swings will keep the little ones out of mischief. 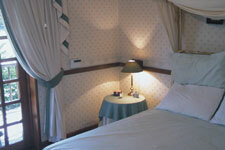 All our rooms are double or twin en-suite, and are appointed to ensure your stay will be one to be fondly remembered. Your well-being is of utmost concern to us; our security systems are state-of-the-art to ensure your peace of mind while you relax in this haven of tranquility.